For thousands of mass transit riders, Chicago's deep freeze Monday meant a bone-chilling commute. And at the CTA, the chilly state of relations between employees and management was back on display. Metra and CTA riders shivered on platforms throughout the region, as frozen switches meant lengthy delays, or in some cases, the outright cancellation of trains which never came. 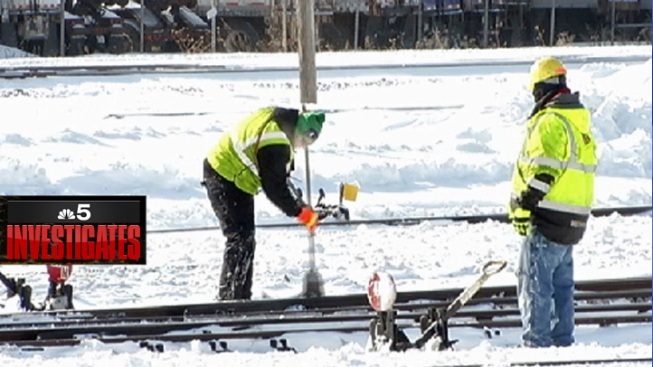 "When you have cold like this, and especially blowing snow like this you have moisture and ice build up in the switches," says Metra's Michael Gillis. "In extreme cold like this, the heaters aren't as effective as they are at other times." Gillis said crews worked throughout the rush hour, and indeed throughout the morning to keep the switches operating. But the situation was aggravated, he says, by the trains themselves, which arrived in yards carrying even more ice and snow. NBC 5's Emily Florez speaks with Chicagoans taking buses in trains in unbearably cold conditions. "When those trains go over the switches, they drop a lot of that ice into the switches," he said. "That has to be cleared again, and if that takes ten or 15 minutes in rush hour, that adds to a lot of delays down the line." At mid-afternoon, Metra workers shoveled and pried frozen switches in the Western Avenue yard, where even open-flame heaters couldn't guarantee the switches would open and close as scheduled. There were similar headaches at the CTA. And at the end of the morning rush hour, it was obvious again why union chief Robert Kelly and CTA management were the don't-invite-'em-items of Chicago labor relations. "They had switch problems because of the weather," Kelly said. "They didn't have enough manpower, I believe, because of the relationship between the Chicago Transit Authority and its members." With his executive committee standing around him, Kelly declared that morale at the transit agency is so bad, that on a day like Monday, workers pull the pillow over their heads, rather than coming in to work on their days off to help with frozen switches and balky trains. "One of the major problems we have today is morale, and the way people are treated at the CTA," Kelly said. "We had people 10 years ago who had their own radios, would listen and say, 'Oh they need help, I'm going in to work!'" "The issues this morning with switching issues and thus, big delays, were directly attributable to morale," agreed board member Wilson Rios. "Most definitely." At a city briefing, CTA president Forrest Claypool bristled at the suggestion that workers weren't pitching in to help. "Mr. Kelly likes to exaggerate, and has a history of such," Claypool said, shaking his head. "We've actually had people out working all weekend, long shifts, some around the clock." "His staff did a remarkable job," Claypool said. "And I'm surprised he would denigrate his own union employees, the men and women of his own union, who did such an extraordinary job this morning." Kelly insisted that the rocky rush hour pointed to manpower problems. "The question is, if you had plenty of people, where was the problem?" he said. During Monday's evening rush hour, Metra eliminated more than two dozen trains.